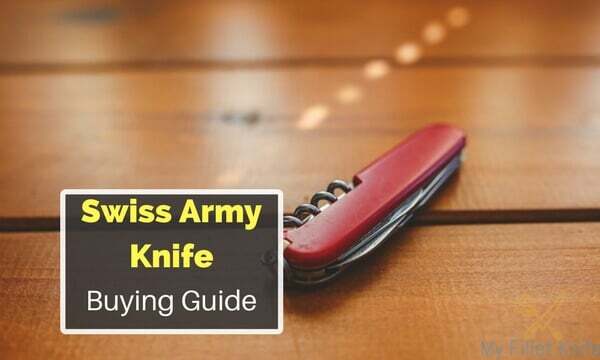 Swiss Army knives are legendary for their versatile use and handy design. There are not many tools that people can actually claim to have saved their lives. The incredible stories span from cutting fishnets while being dragged into the sea by large catches, to actually fixing loose rail line connections to save the lives of hundreds. During the 2011 Christchurch earthquake, doctors even performed surgery on a distressed victim with this knife, believe it or not! Although my experience with these knives is not that extreme, they came in real handy for me in the past, especially in the wilderness. I still remember the time when I lost my entire toolbox during a camping trip, and still managed to survive a whole week with possibly the best Swiss army pocket knife I had in my side pocket. I cut fish and meat, set up tents, and at one point, even opened the display of my wristwatch after water leaked into it during a careless swimming trip. I realized that if I were to choose a single tool to bring anywhere, a Swiss knife would be it. 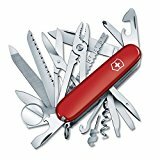 So, to help people choose a new Swiss Army knife – whether it’s their first or the 50th – I have compiled a list of the best Swiss Army knife you can buy right at this moment. This list comes from my years of dealing with them, and I am pretty sure some of the picks would suit your taste just perfect. A) What Will You Use it for? B) How will you carry it? Which Swiss knife should I get? Who makes the best Swiss army knife? What is the best material for knife tools? Are Swiss army knives legal? Are the gimmicky, tech-heavy knives worth it? 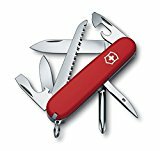 The SwissChamp from Victorinox is a classic knife that has all the premium features the Swiss manufacturer has to offer. With 33 functions, you’ll find a tool for pretty much every occasion. The tools include the large blade, bottle opener, scissors, screwdriver, corkscrew, pliers, and many more. Of all the tools Victorinox makes, one of the most practical ones is the Hiker. 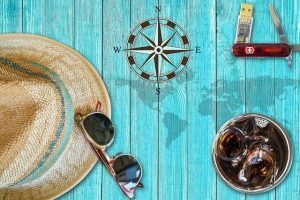 Specifically designed for outdoor use, the implements of this one includes small and large knives, can/bottle openers, screwdrivers and wood saw. With a lightweight but durable build, this is perhaps the best Swiss army knife for camping. So, what is a Swiss Army knife, or SAK in short? Chances are that you’ve already seen one – it is those multipurpose pocket knives that pack a tremendous amount of tools and functions. For the Swiss knife, these can range from screwdrivers and can openers to LED light, flash drive, and magnifying glass. There are hundreds of different versions available in the market with many different yet useful features for you. As for types of these knives, there’s really to black and white product category. Pretty much all Swiss knives come with some basic tools, and from there on the functions tend to diversify tremendously. 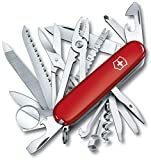 As for brands, the oldest Swiss knife makers are Victorinox and Wenger from Switzerland. Nowadays, there are a number of other companies who make similar products, such as Leatherman and Gerber. 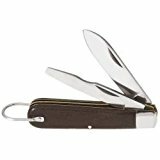 With Victorinox being the oldest and the biggest manufacturer of swiss army pocket knives, you will see a number of their models pop up in this list. The first is the Victorinox Swiss Army Tinker Pocket Knife. Surprisingly small yet functional, this sleek little knife is the perfect pocket knife for everyday use. 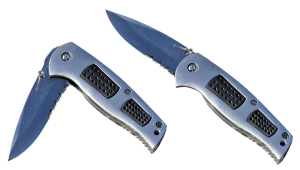 The Valtev Quality 13 Function Stainless Steel Folding Pocket Knife comes with something you won’t find in your everyday Swiss Knife – an LED flashlight! The battery-powered light is complemented by a 2.5″ blade and 12 additional tools for your ease of use. Oh, its nylon pouch makes it the best Swiss army knife for EDC too! Klein is a reputed manufacturer when it comes to handy tools, and its Tools 1550-2 Pocket Knife with 2 Carbon Steel Blades proudly holds up the tradition. With two steel blades, screwdriver-tip blades, and a pretty compact size, this is the ultimate solution for your lightweight pocket knife needs. 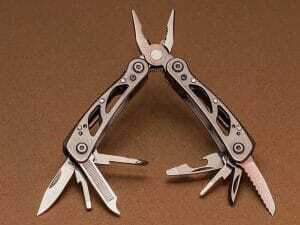 A Leatherman is the American version of the Swiss knife that delivers pretty much the same value for your money. With Leatherman’s Crater, you get a modern, sleek looking pocket knife that comes with some very handy tools. These include a twin edge serrated/straight blade, bottle opener, screwdriver, and carabiner clip. If you don’t like the bulky, way-too-many-tools models of these knives, then give the Swiss Army Classic SD Pocket Knife from Victorinox a try. This perfectly pocket-sized knife comes with seven functions that you’ll need in your everyday life, including a toothpick, tweezers, nail files, and more. 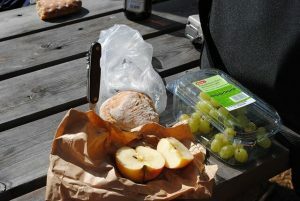 Another great knife from Victorinox, the Hiker was specially designed with outdoor use in mind. 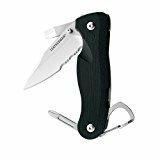 With stainless steel implements like small and large knives, can/bottle openers, screwdrivers, and wood saw, this compact knife will save you a lot of hassle during your next camping trip. If you wanted a couple of cool new features with the trusted Victorinox name, then the swiss knife for you would be the Signature Lite. It comes with an LED light, and tools like a blade, screwdriver, nail file, scissors, key ring, and a retractable pen. There’s a saying that of all the Victorinox models, the Farmer is the most Swiss of them all, and when you see it in person, you instantly realize why. With a sleek build designed for heavy outdoor use, you get a couple of blades, screwdriver, cap lifter, wire stripper, and wood saw with this one. With the SwissChamp Pocket Knife, we step into elite Victorinox territory. This premium knife has long been among the company’s best sellers, and for good reasons too. With a whopping 33 functions, you’ll find a tool for pretty much every occasion. You’ll also get standard Victorinox features like stainless steel build and lifetime guarantee. 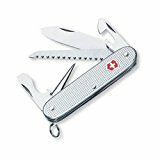 A less confusing version of the SwissChamp, the Climber from Victorinox comes with all the good of the previous one while being light and practical enough for the harsh outdoors. With 13 tools and a durable stainless steel build, you can take this knife to regular fishing and camping trips without any worry. The Rescue Tool from Victorinox was developed in consultation with professional safety and rescue service personnel. With 15 functions suited for everyday use, outdoor use, and particularly for emergencies, this is a must-have for any enthusiast. 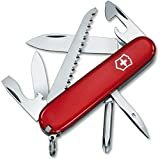 As for our recommendations, the SwissChamp from Victorinox is a top-notch knife with all the premium features the Swiss manufacturer has come to be famous for. Its 33 functions makes sure that you’ll find a tool for pretty much every occasion. When it comes to practicality, the Victorinox Hiker is hard to rival. It is specifically designed for outdoor use, and can withstand quite the wear and tear while offering a high level of reliable performance every time. Before buying a knife, make a mental list of what will you be using it for. 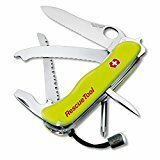 Are you looking for best Swiss army knife for survival? Or do you need a simple, everyday tool that can perform a few basic functions? Or maybe you’re looking for a Swiss knife for a light camping trip? Your needs should determine the type of knife to buy, not the other way around. A big mistake many buyers make while buying a new knife is that they buy a knife for its features only, without thinking if it’s the best knife for EDC or not (EDC stands for Everyday Carry, by the way). For example, in 2006 Wenger brought out a knife called “The Giant”. This behemoth had all the tools the company ever produced – 87 in all. Though that’s very impressive, it is not very practical to take it on a hiking trip, is it? Think about how you will carry it before buying – will a clip-on feature be enough, or would you be comfortable carrying a fanny pack for a larger knife? Price is a huge factor as far as quality of these knives are concerned. While the basic ones are priced reasonably, the best ones may cost quite a lot. Do you really need a premium knife, or a regular one will do? What kind of tools would you be needing the most? If you’re a frequent camper, a knife with a lot of cutting implements might be more suited for you. If you spend most of your time with gadgets, you might feel more comfortable with a set of screwdriver implements. Most people buy these knives with a lot of tools without any proper plan to utilize them. Be a smart buyer, and examine the tools carefully with your needs in mind before buying. Did you know there are Swiss knives out there with laser pointers and flash drives these days? They may be a bit of an unorthodox choice when considered as implements for pocket knives, but useful nonetheless! The regular Swiss knife can handle pretty much anything you need to cut in your daily life. Fruits? Check. Vegetables? Check. Papers and crafts? Check. 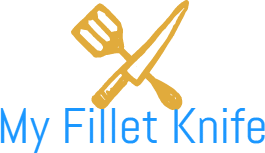 One of the most common uses of these knives is to open stuff – ranging from tin cans to boxes, cartons, and even chests. You can use the tin cutters, the blades, or even the lockpicking implements to get your job done. These knives can easily help you with light cooking at home, or some more in the wild. You can chop vegetables, fruits, and whatnot with a trusted knife. Swiss knives are best known for how much they offer in how little a package, and it is the truest while in the outdoors. From setting up tents to cutting up fish or small pieces of wood, the finest swiss knife for survival will deliver every time. With a new iteration of these tools, you can even get a laser pointer or a flash drive. Talk about true multitasking, right? A point to start for you would be to decide what you’re going to use your knife for. If it’s for everyday use, a few tools like a nail file, tweezers, and toothpick will do. If you’re thinking outdoors, try picking a knife with a large blade, wood saw, bottle opener, etc. The oldest and only authentic manufacturer of these knives is Victorinox. Their knives are usually long-lasting, and pretty effective. But if you prefer something closer to home, the American-made Leatherman and Valtev are good too. The most durable and long-lasting tool material is stainless steel, for both indoor and outdoor use. For light use, carbon steel tools are good too. That depends on the country you’re talking about. For example, in the US, you can carry these knives with blades smaller than 2.5 inches without any hassle, while the measure is 3 inches in the UK. Before buying your knife, make sure to check the relevant laws of your country. Knives these days will come with high-tech offerings like LED lights, flash drives, and laser pointers. While they sound exciting on paper, they often tend to falter within a couple of weeks. We suggest you stick to the basic knives just to be on the safe side. Swiss Army knives are some of the most useful, practical, and even nostalgic tools for most people. If you’re looking to buy your first one, or just adding another one to your collection, our list can help you choose. Pick the best Swiss Army knife from this list, and you’ll never have to worry about having a handy tool for everyday use again.